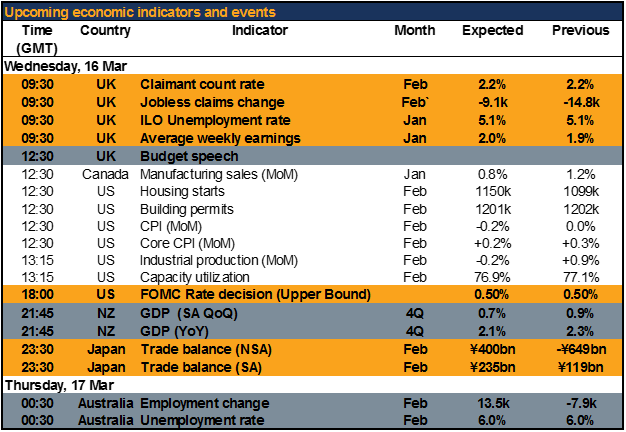 09:30 GMT: UK Labour market data (Jan, Feb) Today’s labour market data will form the backdrop to tomorrow’s Bank of England Monetary Policy Committee meeting. 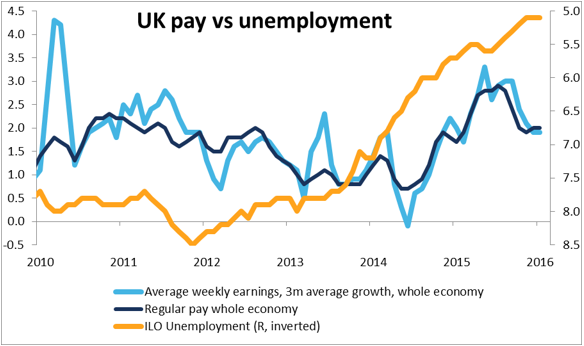 The figures are expected to be in line with previous months’ figures showing a steady improvement in the labour market, including a slight uptick in average weekly earnings. Normally this would be a major indicator for the UK, but today it’s likely to be overshadowed by the Budget. Pre-election budgets are generally “give-aways” that aim at boosting the economy and the popularity of the ruling party, while “post-election budgets” tend to be “clean-up” budgets where the winners try to get all the restructuring pain out of the way as early in their administration as possible. Furthermore, Chancellor Osborne has pledged to bring the budget into balance within the life of this Parliament, which is a fairly tight schedule. However, it’s not politics as normal in Britain right now. The upcoming Brexit referendum is far, far more important than any election. It’s almost an existential decision for the UK — nobody knows what would happen not only to Britain’s economy and its role in the world, but even to the United Kingdom itself if they vote to leave. Against that background, I think winning the “in” vote will take priority this time around. At the same time, blatantly abandoning his fiscal target in order to win the vote would undermine Chancellor Osborne’s credibility and indeed mar the entire “in’ side. So it’s going to be a tricky balancing act. I’d expect to see a fairly neutral budget, one that’s less restrictive than usual for the first budget after an election and perhaps also less restrictive than Chancellor Osborne might prefer, but by no means in the “give-away” category. Macroeconomic theory doesn’t say anything about what a loose monetary/loose fiscal policy mix should do for a currency. 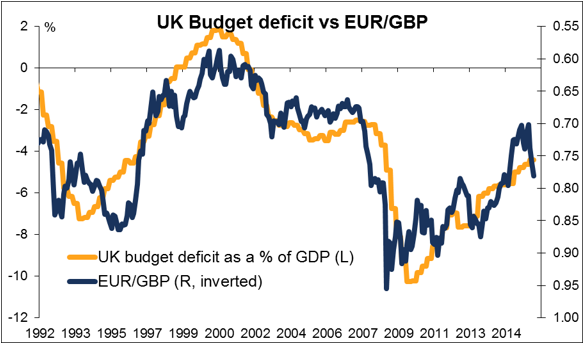 However, the reality right now is that a budget that makes it less likely Britain will leave the EU should be positive for the pound. So I’d expect consumer sentiment in the UK to rise after the budget and for the pound to gain as a result.